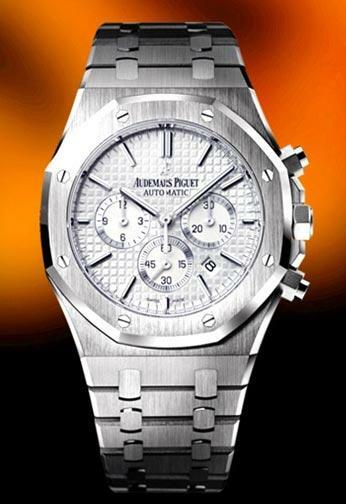 Audemars Piguet Royal Oak Chronograph Ref. 26320ST.OO.1220ST.02 41mm stainless steel case, silver dial with Grande Tapisserie pattern, white gold applied hour-markers. Audemars Piguet Royal Oak Chronograph Ref. 26320ST_OO_1220ST_02 41mm x 10.80mm stainless steel case, screw-locked crown, glare proofed sapphire crystal, silver dial with Grande Tapisserie pattern, white gold applied hour-markers, and white gold Royal Oak hands with luminescent coating, self-winding Audemars Piguet Calibre 2385 movement with chronograph, date, and small seconds, approximately 40 hours of power reserve, stainless steel bracelet. Water resistant to 50 meters.